Intended for climbers looking to push their game to new heights, our Level 2 Rock Climbing camp teaches the fundamentals of Multi-Pitch climbing. 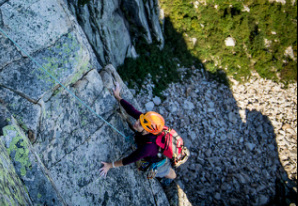 Under the care of our expert guides campers will ascend the airy heights of Cannon Cliffs and Cathedral Ledges, some of New Hampshire’s most iconic crags. Along the way attendees will learn advanced anchor building skills and lead climbing techniques. We will focus heavily on mastering precise body movement and control alongside technical skills including knots, rope management, clipping protection on lead, and following the leader. All necessary gear (including harnesses, shoes, and helmets) will be provided. All Campers must have completed Rock Climbing Level 1 or have equivalent experience in order to participate in Level 2.